www.texthelp.com • Retail Price: $645. For an additional $95, customers can purchase a Software Maintenance Agreement, which then gives you free access to Read&Write Web apps. 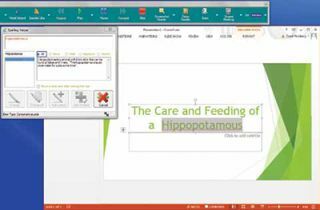 Read&Write Gold for PC bundles several electronic tools in a flexible floating desktop toolbar with customizable support targeting skills for reading, writing, research, and study. Quality and Effectiveness: Read&Write tools are designed to help students communicate ideas through written text and audio voice notes. The new Version 11 adds new features and improvements without crowding out tools already available. For example, youngsters can use the new Word Cloud facility to generate words that identify and define keywords in selected text. A new Voice Note facility lets users insert an audio recording into a Microsoft Word document. Other tools in the Read&Write toolkit include text-to-speech for reading text aloud, word prediction so students can write by choosing words from pop-up lists, a Daisy reader to read-aloud e-books, a screen shot reader, a pronunciation tutor, and more. Ease of Use: Users familiar with the previous version of Read&Write Gold will find no major surprises in the program’s graphical toolbar. An online Help file is available on the toolbars as a drop-down option. Creative Use of Technology: Read&Write Gold simplifies access and use to prevent users from getting lost or distracted. Additionally, textHELP has several ready-made toolbars with preselected facilities for reading, writing, research and study. Suitability for Use in a School Environment: Read&Write Gold version 11’s numerous text, read-aloud, and picture tools encourage and support student-centered learning, enabling teachers to customize how and what they teach and providing students with tools that present information in flexible ways. The latest version offers enhanced support for Chrome and Firefox, in addition to Internet Explorer. • Several useful literacy-building tools are included under one integrated toolbar roof. • Tools are flexible and easily personalized to meet individual student needs, not just those with significant cognitive or print disabilities. • Product works well with several browsers and common applications typically used in schools. OVERALL RATING: Read&Write Gold for PC integrates a variety of flexible desktop tools that students can manipulate and modify to suit personal preferences.